Launched in December 2014, Naver Window is an online open market platform only for the off-line (brick and mortar) stores. It’s like an ‘online show room’ but you can also make payments. It attracts customers with detailed explanations on their products, any feedback and is then favored by Naver’s services. 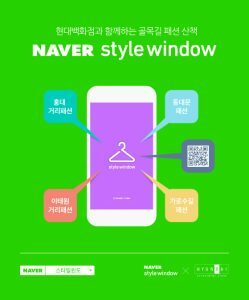 ‘Naver Windows’ operating at department stores are named as ‘BaeHwaJum Window(백화점윈도)’, Naver Windows operating for farms are ‘Food Window(푸드윈도)’, and clothing shops are ‘Style Window (스타일 윈도)’. In addition, there are living, kids, beauty, outlet, play etc, a total of 8 categories. How has Naver Window been performing? Naver Window was launched with the question of ‘how can people easily get information about off-line stores and their products?’ and it seems like it has worked out pretty well over the last 2 years. 70% of ‘BaeHwaJum Window (백화점윈도)’ stores had a significant increase in sales. More than 6,000 Windows are operating in Korea and the volume of business per month is USD 30m. 45% of the Naver Window operators said their online sales are similar or more than off-line sales.